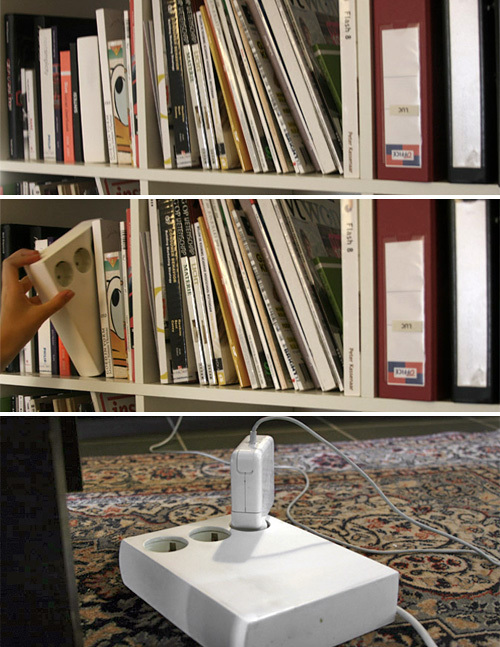 Stekkerboek Concept Hides Unused Power Bars On Your Bookshelf | OhGizmo! Even though ‘unused power bar’ is an oxymoron in my home, I still like this design concept from Dave Hakkens which gives everyday devices a book-like form factor. So instead of tossing them in a drawer or in a Rubbermaid container when not in use, you can keep them out on display where they add to the aesthetic of a room, and are also easily accessible and easy to find. And while the Stekkerboek does look a bit bulky as power bars go, the extra space houses a generous, and useful, 8 feet of extension cord. Just make a version for North American style plugs and I’ll take 10!